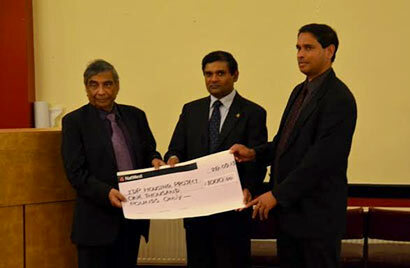 British Sri Lankan Forum (BSLF) donated £1000 for the Resettlement Housing Project of war victims in Sri Lanka at a function held recently in Birmingham for the same purpose. The money was raised at a dinner and a musical evening with a patriotic theme held at the Parish Church of All Saints, Queensbury on Saturday 08 June 2013. It was extremely successful and we have been able to donate a substantial amount of money for the resettlement of the victims from the money raised. Members of the BSLF sincerely thank everyone who participated and contributed in numerous ways to make this event a tremendous success. Picture shows Janaka Alahapperuma and Vasantha Karunathilaka handing over a cheque for £1000 to Dr M.B.Ranatunga, the coordinator of the project.